"Find new ways to spread the word of God to every corner of the world." The My Catholic Faith Delivered platform enriches our faith by removing barriers to learning. 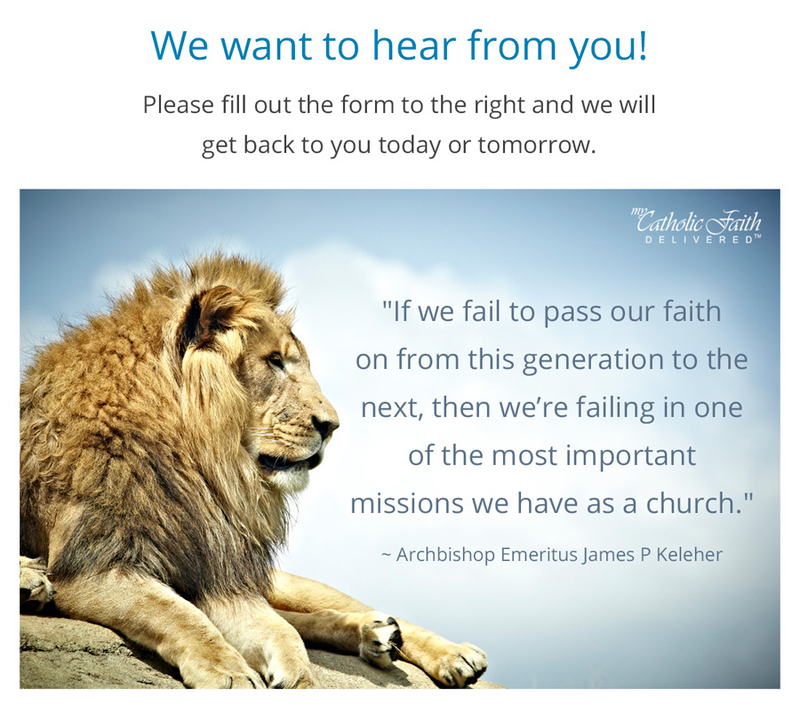 Through MCFD’s delivery system and global Catholic library of content, you can meet today's parishioners where they are - anytime, anywhere and from any device. Scalable and configurable, MCFD's solutions are customized to meet your needs. Blended learning allows you to use a combination of live events and online learning to meet the needs of multiple learning styles and busy schedules. Create and track learning, activities, and events. Track certification progress and award learners with branded certificates. Define certification tracks and attach credits to outside or previous learning. Easily create and monitor user accounts, classes, and groups. View and download data for analysis and reporting. Add an element of fun and inspire users through gamification. Take your learners on a journey where points are accrued and badges are automatically rewarded as they complete tasks. Use MCFD's large library or create your own. Curate and manage group libraries, keep resources close for on demand access. Easily reuse, repurpose and share! Your valuable intellectual property is private and secure. Easily construct lessons with a library of pre-built templates. Quickly create layouts and interactions using built-in tools. No code to write! Educate using outcomes. Using MCFD's robust analytics platform, users have additional lessons automatically generated by assessment performance based on their own outcomes. Review content to show mastery. Easy, accurate way to assess learning with questions linked to diocese specific outcomes. Using a repository of over 7,000 assessment questions, questions are aligned to the six tasks of catechesis. (RE curriculum, language neutral). Offer online learning courses that are accessible anytime, anywhere from a variety of devices. Create groups to increase members’ involvement. Lead or participate in discussions and share content with others. Adopt a development environment of leaders helping leaders. Share multi-media resources with your organization or group. Attach these resources to create meaningful discussions. In today’s continuously connected world, information rapidly becomes obsolete. Through MCFD's Moment-In-Time, you can take advantage of the audio/video capabilities of devices to ensure a true just in time experience. Create content both on and offline. Sell your content and create a new source of revenue by leveraging an integrated eCommerce store. Each course can be sold individually or as part of a package. Originally created for The Archdiocese for the Military Services (AMS), this front facing library has content organized for easy recall and reuse. (No login or tracking.) Powerful search features, top ratings, and keywords make finding content extremely easy. Leading Catholic content providers have shared their content, for free, through the Digital Media Center. Manage a calendar of events, assignments, and live classes. Interact with groups and class members to increase engagement. Create and view interactive simulations and games. Create unique activities and assessments for your class. Offer the same content in many different languages. Automatically scored assessments that give immediate feedback. View detailed group and progress reports to assess learning. Keep a history of your entire learning journey. Send custom group emails to encourage participation. Tailor the system to reflect your brand identity.